If you work in DevOps or software QA, you likely already know why automated software testing is essential for quality control to keep pace with continuous delivery. Automated testing delivers faster results and more thorough coverage, and enables shift-left testing for earlier detection of bugs. Yet the issue of how to approach automated testing remains difficult for many QA teams to solve. A range of obstacles makes it challenging to begin automating software tests, or to increase the extent of test automation beyond the basics. 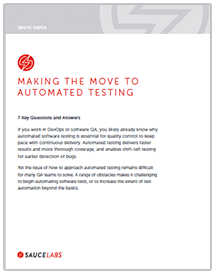 Download the white paper and learn the answers to the seven most common questions that software delivery teams must answer in order to adopt test automation successfully.